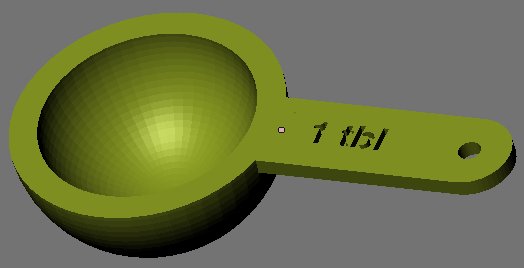 I recently developed some measuring spoon models. The math and basic design were, surprisingly, the easy part. Attempting to realize an idealistic design within the constraints of the real-world was a bit more difficult and ended up being the majority of the work. The design itself is fairly simple. Maybe you remember the volume of a sphere from geometry class, maybe not. Either way, you can confirm with Wolfram Alpha. You then chop that in half because the spoon’s scooper is only a half-sphere. That half-sphere is the hollow part of the scooper. Make a slightly larger half-sphere and fill in-between, giving the scooper thickness. Attach a rectangular handle (which is technically a geometric “prism” rather than a 2-D “rectangle”), and cap it with half of a cylinder. Then, subtract out a hole to attach it to a keyring or lanyard. That’s it. If you want to get really fancy, subtract out some text from the handle to give you a label. The result is a perfectly idealistic spoon that can be designed in OpenSCAD and rendered in Blender. Then, you push this idealistic file to the printer and see what happens. The real-world results can be not exactly optimal. I had a number of printing errors, due to the (lack of) capabilities of my older print-head that needed several rounds of correction. The embossed label had to go. It was too detailed for the hacks I had to make to my extruder motor. The wall thickness of the scoop had to drastically increase. In printing the apex of the scoop (the spoons print face-down), I’m fighting both extruder capabilities and gravity. After making these design concessions, I ended up with a pretty decent design — perhaps not as sleek as I’d hoped, but not as blocky as blocky as others’ designs. It is still a work-in-progress. I am trying to come up with a handle and label that prints well. Where “v” is the volume in milliliters and your result is the radius in centimeters. 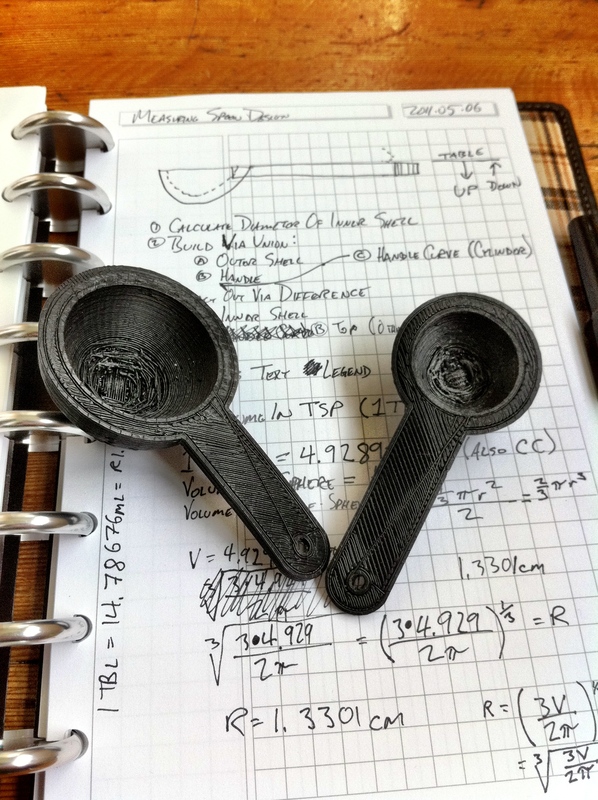 Multiply your result by 10 (to convert to millimeters — OpenSCAD only deals in mm) and plug it in where the measuring spoon file asks for radius. That’s it. Many more details and pictures are at the Thingiverse project page.